A user action is an interaction with the web browser that involves a call to a web server, which can potentially have multiple nested calls. A user action can be a page load, an XHR action or a custom action. The key difference among these action types is the way action duration is calculated and that for each type there are different metrics available. 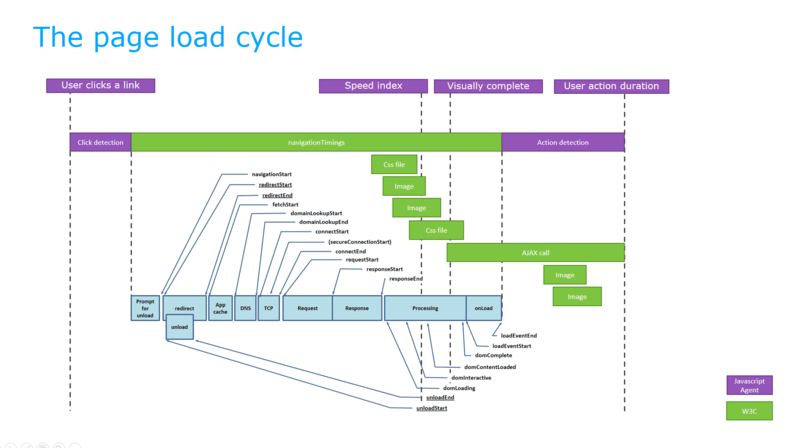 A page load is an actual page loading in your browser. If you enter a URL in your browser and press enter, a page load occurs. During a page load, many resources are loaded, including images, HTML, and CSS. The following measures are used to chart the duration of specific steps in the page loading process. Dynatrace continuously tracks user interactions with each page. If user interaction leads to XmlHttpRequests or fetch() calls, an XHR action is created. Dynatrace also detects if there are additional XHRs triggered in the callback of the initial XHR and so on. In this case, Dynatrace waits until all requests are finished. 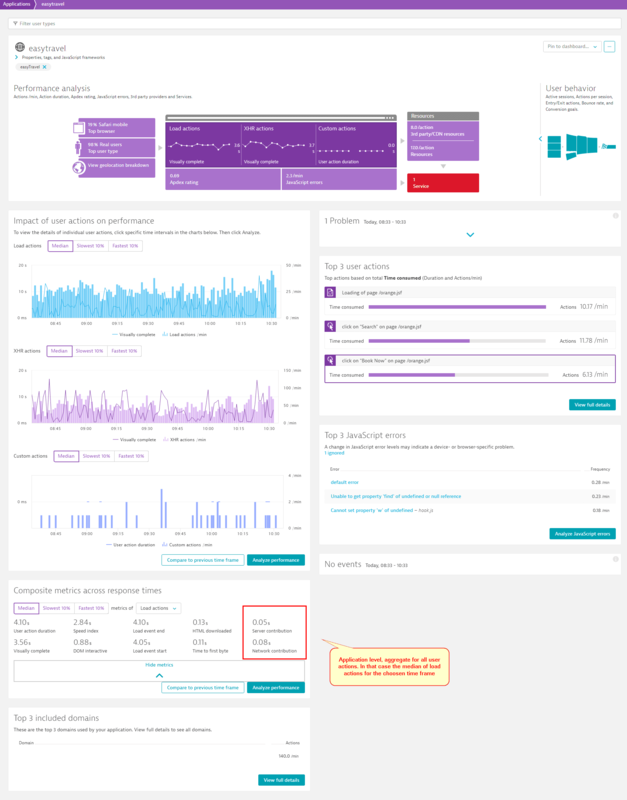 By monitoring the DOM, Dynatrace can also identify resources that were added in the callbacks. Dynatrace then waits until those resources have finished downloading before ending the action. An XHR action starts with the user&apos;s click on a control on a web page. All metrics (see the table below) are calculated in relation to this point in time and are based on the initial XHR that triggers the user action. Callback start The start time of the first callback that handled the response of the XHR/fetch. Callback end The end time of the last callback that handled the response of the XHR/fetch. Visually complete The time at which all content in the browser&apos;s visible area is fully rendered. User action duration Time spent from initial user click through completion of all XHR callbacks and dynamic resources triggered by DOM modifications in the callbacks. The Fetch API provides an interface for fetching resources (including across the network). It is similar to XMLHttpRequest, but the API provides a more flexible feature set. The generic definitions of Request, Response and other network request objects in Fetch allow them to be used at any time they are needed, whether it’s for service workers, Cache API, or anything that handles or modifies requests and responses. Fetch also supports the Cross Origin Resource Sharing (CORS). User actions based on the Fetch API appear in Dynatrace as XHR actions. You can configure Dynatrace to automatically detect and capture Fetch API request information. Select Applications from the navigation menu, then select the application you want to configure. On the application page, click the Browse (…) button in the top right corner and choose Edit to access settings for the specified application. Click Async requests and single page apps, then on the Async requests and single page apps page, select the Capture fetch() requests option. So these components contribute to the overall duration of a user action; hence the term "user action contributors". Many applications allow users to accomplish the same goal through different UI controls. When monitoring such applications, it can be difficult to differentiate between actions that have the same result and goal, but are executed using different parts of the application UI. Likewise, if the UI of an application is translated into multiple languages, the same application function or control may appear under varying names. 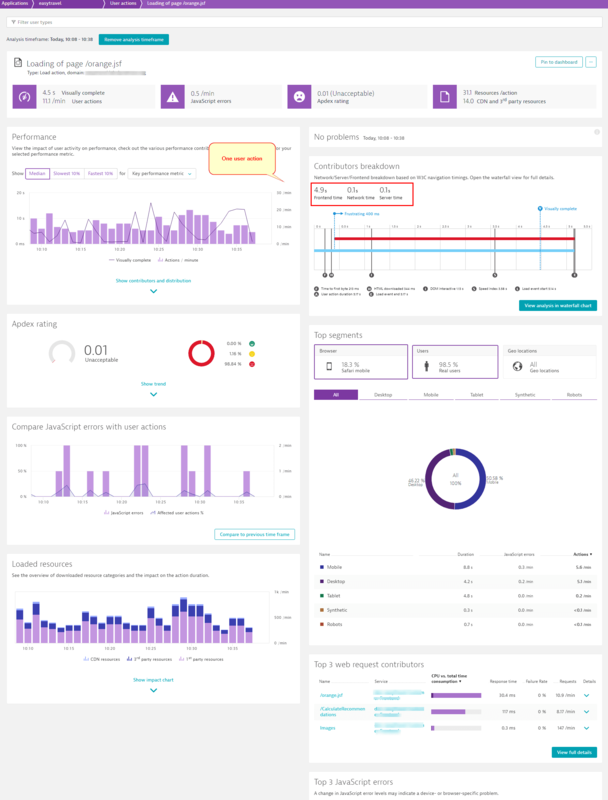 With user action naming rules, Dynatrace can detect such subtle variations and intelligently group related user actions (i.e., user actions that achieve the same goal) into logical groups for monitoring. Dynatrace automatically removes certain common sessionid tokens from user action names (for example, jsessionid for Java containers, the default sessionid for PHP, and CFID and CFTOKEN for ColdFusion). Nonetheless, there are numerous session ID variations that may be present in your environment. If Dynatrace doesn&apos;t automatically recognize and remove session IDs from certain user action names you encounter, you&apos;ll need to configure custom naming rules for those user actions.